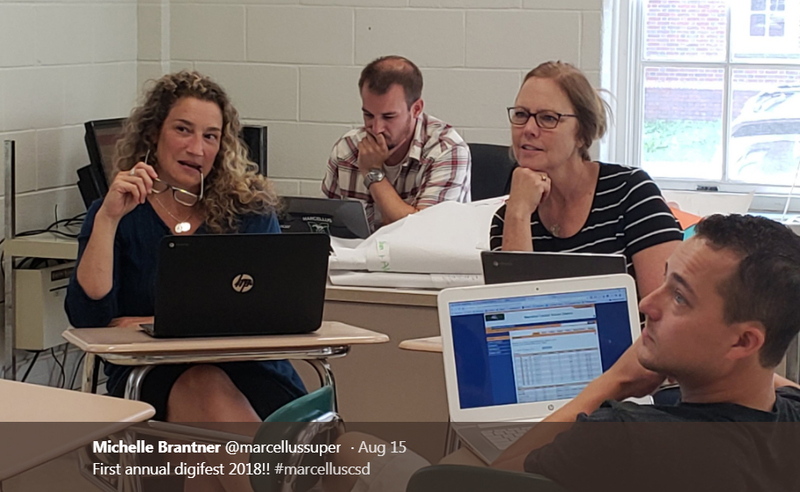 Aug. 28, 2018 -- The Marcellus Digital Conversion Steering Committee hosted its first annual Digifest on Aug 15. The daylong event provided an opportunity for professional development in a collaborative style. Utilizing the “edCamp” structure, the event allowed participants to designate work topics and form groups on their own, while remaining fluid enough for people to leave and join groups as their needs evolved throughout the day. “We were excited to begin our first year with 36 registered participants,” Superintendent of Schools Michelle Brantner said. Thanks to event sponsors C&S Companies, which provided breakfast treats, as well as Coach, Fulton Screen Print and Embroidery, Leanna Brier Massage Therapist, Chocolate Pizza Company, Finally Ours, Edible Arrangements, The Blarney Stone, Gannon's, North Street Diner, Blooming Gals, Mid Lakes Navigation, Dunkin Donuts, Beak & Skiff 1911 and the American Dairy Association. We look forward to Digifest 2 in 2019!